Move your oven rack to the lowest position. 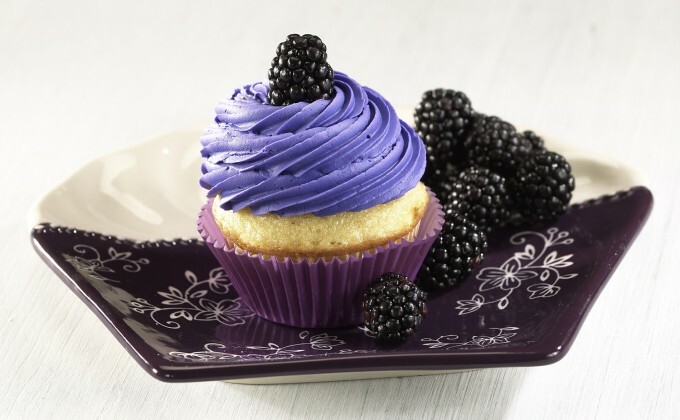 Line your temp-tations® 6-cup muffin pan with paper cupcake liners. If using one pan you will need to bake these in 4 batches. For the cupcakes, sift together the flour, 3/4 cup of sugar and salt. Set aside. Place the egg whites, vanilla and cream of tartar in the bowl of a stand mixer. Using the whisk attachment, mix on medium-high speed until soft peaks form. Gradually add in the remaining 3/4 cup of sugar and mix until stiff peaks form. Gently fold in the dry ingredients with a rubber spatula. Fill each cupcake liner two-thirds full with batter and bake for 12-15 minutes or until lightly browned. Cool completely. For the frosting, place the butter in the bowl of a stand mixer. Blend until fluffy. Mix in blackberry puree and lemon juice until smooth. Slowly blend in powdered sugar until smooth. Add more if necessary. Spread frosting on each cupcake with a butter knife or pastry bag. Top each one with a whole blackberry.